There are numerous variations of pita bread recipe, especially since various cultures around the world have made it part of their daily cuisine. For example, in the Mediterranean, pita bread is dipped in special sauces such as humus. It is also used as a sandwich wrap for kebabs or falafel. The Turks on the other hand create a pizza out of it called lahmacun. Pita bread is a staple food and is very popular in Middle Eastern and Mediterranean food preparations. It is round dough made from yeast baked at high temperatures until it turns brown. During the late twentieth century, pita bread became much more than a bread; it became a complete meal. The pocket, formed during the baking process of the pita bread, was filled with meat, cheese, and other stuffing’s, which subsequently became known as the pocket pita. Prepare the yeast and water into a mixture then mix in the salt and the flour. Work the mixture into dough and knead it for a several minutes. Let the dough stand in warm air for three hours with a moistened cloth placed atop of it. Cut the prepared dough into about six equal portions and roll them to form a ball. Press each ball into a flat round dough and bake it in an oven pre-heated to 350 degrees. You will know if the baking of the pita bread is done when it’s color turns to a light golden brown. Pita bread lovers will be glad to know that their favorite pastry is good for the health. It is known for being a low Glycemic Index food. This means that the bread manages energy or glucose spikes by helping to regulate the carbohydrate level in your body. 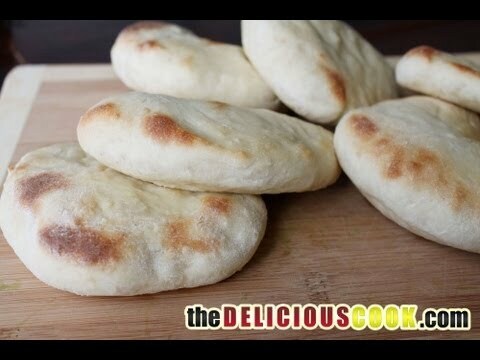 Following the simple pita bread recipe above will give you the staple food you know that is both healthy as well as flexible in terms of food preparations.